« Lesbian couple pulls off best wedding engagement ‘flash mob’ ever! The Jewish New Year is upon us, making the time ripe for a wistful reflection on all those beautiful, stunning, heart-felt vow exchanges I had the pleasure of officiating and witnessing this past year in metropolitan Philly. Do you have wedding coming ahead in the 2014 calendar year? If so, here are a few of my Favorites, for all things related to weddings. By the way, none of these places or businesses are giving me any “kickbacks” for endorsing them — they are, quite simply, my favorite sites and sounds for weddings in Philadelphia! Drop me a line at Joysa@aol.com if you’d like information on hiring me to be your officiant. I specialize in Jewish and interfaith weddings, as well as secular/nontheistic weddings for couples coming out of any religious tradition. #1: Best Philly Wedding Venue: Sweet Water Farms in Glen Mills takes the cake as most elegant. sophisticated, and yet tuned-into-nature venue of anywhere in metro Philly. 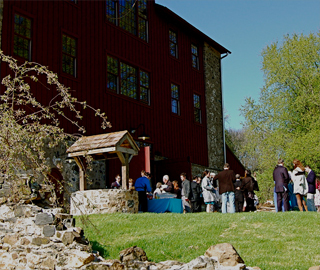 The former summer home of the infamous Grace Kelly, Sweet Water farm today acts as a winery, a small-scale B&B, and a rustic venue replete with an old-time wooden water well, a two-story farm house decked out in twinkly white lights, and rolling views overlooking horses, wild flowers, and a heated pool and jacuzzi. The 50–acre historic estate features 14 guest rooms: three in the original 1734 Quaker farmhouse wing and four in the 1815 Georgian wing. The original carriage house, greenhouse and caretaker’s cottage have all been transformed into seven guest cottages, five of which are pet– and child–friendly. Other amenities for a perfect getaway are a swimming pool, outdoor hot tub, golf chipping range, nine-hole disc golf course, private massage room, fitness room, walking trail and a friendly family of horses, sheep and goats. #2 Best Wedding Dress Shopping Online: BHLDN. When it comes to shopping for that perfect wedding dress, you can’t do better than BHLDN. Their beautiful, flowing — and most important of all — UNIQUE gowns flatter every body size and can work with nearly every budget. When it comes to wedding dresses, BHLDN has captured my soul. This Kauai wedding dress costs only $800 and is probably one of the most unique, imaginative dresses I’ve ever imagined walking down the aisle in! While the form flows free, elegant details like intricate embroidery, an asymmetrical hem, and a slender braided neck ribbon with crystal button closure ensure this dress is anything but ordinary. Can’t you just picture it on a seashore wedding, walking barefoot in the sand? This Lita Gown (below right) sells for a bit pricier at $2,400. But it is made of pearly beads that trim the edges of a gauzy, attached coverlet above a sleek dress of luminous silk charmeuse. Though not pictured here, a thin, self-tie string of silk at the nape of the neck ensures sleeves won’t slip off your shoulders. The gown has underwire and bust cups, silk tulle and silk charmeuse shell, as well as a silk charmeuse lining. The company sells all sorts of other keepsakes useful for a wedding. For example, check out these beautiful, antique-looking gifts for the bridal party, as well as picture holders that could be used to decorate tables in a reception room. This beautifully articulated shining scallop opens to reveal a single pearl to hold the wedding bands. Handmade from silver, nickel-plated brass and pearl, they measure 1.5”H, 2.75”W, 2.75”L. More decors can be viewed here: www.bhldn.com/the-shop-decor-keepsakes/.